BUFFALO WILD WINGS BIG TENT EVENT!!!!! It's the most WONDERFUL TIME OF THE YEAR! It's time for our 2017 BWW Big Tent Event! 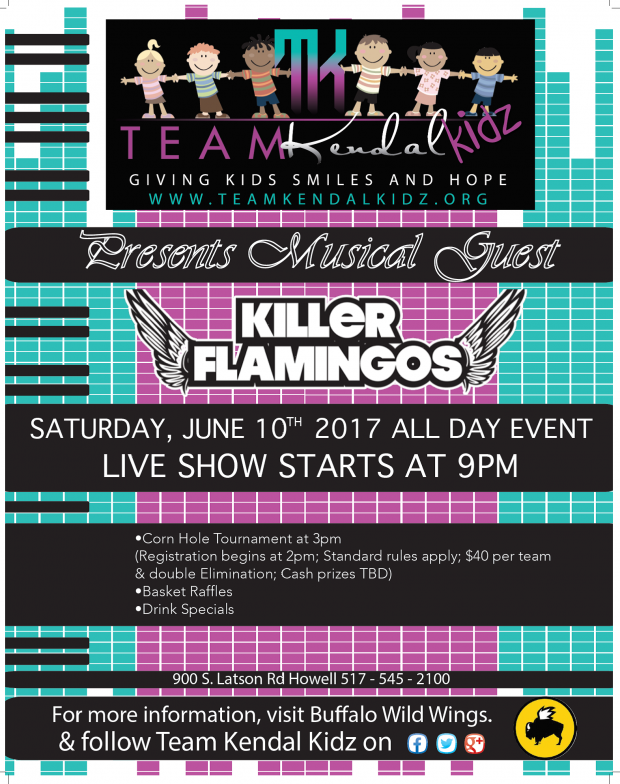 We will once again be rockin' the tent with the Killer Flamingos at BWW in Howell. So mark your calendars for Saturday June 10th. The corn hole tournament starts at 3pm (registration at 2pm). It will be $40 per team, double elimination and cash prizes TBD. All standard corn hole tournament rules apply. For more info on how to register contact BWW at 517-545-2100. As ALWAYS to make this day a success, we NEED donations for our raffle/auctions items. Every item makes a huge difference in the life of a child battling cancer. If you are able to help us out please contact me at Info@teamkendalkidz.org. We take it all golf, salons, restaurants, event tickets, sporting memorabilia etc. Thank you for helping us Give Kids With Cancer SMILES For Today and HOPE For Tomorrow!